If you are getting married in Cornwall then beach weddings Cornwall or wedding venues in Cornwall by the sea offer stunning beach or cliff top photo opportunities - what better backdrop for a Wedding in Cornwall than the beautiful Cornish Sea! 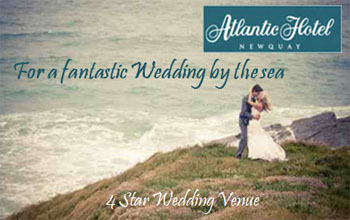 Have your dream Cornwall Wedding by the sea! View our list of wedding venues in Cornwall by the sea below. What a wonderful place for a wedding in Cornwall! Say "I do" to the sights and sounds of the sun dappled sea lapping gently against the shoreline. Wow your guests with the stunning coastal views and then treat them to delicious food with your wedding reception held in the elegantly laid out dining room. Whether you are looking to have your full wedding day at the hotel, from your Wedding Ceremony to your Evening Reception, or perhaps a more low key and intimate Wedding Breakfast - the highly trained staff at the Greenbank offer complete flexibility to build your perfect day! 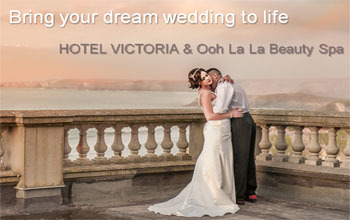 Let The Legacy Hotel Victoria bring your dream wedding in Cornwall to life at one of Cornwall's most romantic and historic locations. Set in a stunning cliff top location with the backdrop of the North Cornish Coast the Hotel creates the perfect setting for your Cornwall wedding. Licensed to hold Civil Ceremonies in Cornwall and Civil Partnerships with three beautiful venues to choose from inside and out The Hotel Victoria can host your wedding ceremony and or your wedding reception in a choice of venues or marquee. So however you picture your dream wedding the dedicated wedding co-ordinator will help you realise it. Read more about weddings at Hotel Victoria. Offshore offers a relaxed and friendly wedding venue in Cornwall with stunning views, fabulous food and impeccable service. The beautiful dunes and far reaching sea views are the perfect backdrop for weddings in Cornwall and the nearby sandy beaches bring lots of wedding photo opportunities. With inside and outside seating and mingling areas the Offshore wedding team are happy to work with you to create your perfect wedding day. One of the stylish wedding reception venues Cornwall the Bedruthan Steps Hotel is a wedding venue in Cornwall set near the spectacular Bedruthan Steps which lead down to the golden sands of Bedruthan beach. The hotel offers spectacular coastal and cliff views and is a licensed Cornwall wedding venue able to offer civil ceremonies, wedding breakfasts and evening receptions. They are able to cater for all wedding types from small intimate Cornwall weddings to larger parties of up to 200 and for those planning a very large wedding of over 200 this hotel is one of the few wedding venues in Cornwall able to cater for these by offering exclusive use of the main hotel. For brides and grooms looking for places to get married in Cornwall, Cape Cornwall Golf and Country Club sits in a Wild and beautiful coastal setting in West Cornwall with stunning cliff and coastal views and the famous Brisons rocks in the background. This wedding venue in Cornwall can cater for all your wedding needs and is one of the Wedding venues in Cornwall where you can hold your Cornwall Civil wedding ceremony and or your wedding reception in a choice of the Brisons function room with bar, dance floor and stage or a marquee on the patio arae. You can of course hold your wedding reception here if you are choosing to hold your wedding ceremony in a nearby church. If you need accommodation for your wedding Cornwall then there is also plenty of accommodation for your guests. The scenery and nearby beaches make a beautiful backdrop for your wedding in West Cornwall. Exclusive Use Wedding Venue In Cornwall? For those prospective bride and grooms looking for wedding venues in Cornwall this is a beautiful Hotel set in private grounds on the edge of Carbis Bay St Ives Cornwall. The hotel is ideal for beach weddings in Cornwall as it is near the golden sands of Cabis Bay Beach and has magnificent seaviews across the sands to the sea. Able to cater for small Cornwall weddings as well as being one of the wedding reception venues Cornwall able to cater for larger weddings of 150. The Carbis Bay Hotel is a wedding venue in Cornwall which can be tailored to meet your precise needs and which is able to offer wedding Ceremonies, Wedding Breakfasts and Receptions. Set near to Fistral Beach Newquay Cornwall The Carnmarth Hotel is a wedding venue in Cornwall which has stunning views across the bay, a perfect backdrop for the wedding day photos of your Cornwall wedding. The Carnmarth Hotel is an approved venue for civil ceremonies, has a contemporarily designed C-Bar,south-facing terrace and a reception room which for those looking for large wedding reception venues Cornwall could be a good choice as they are able to hold up to 200 in the room which is designed in a silk draped marquee style and has a bar and dance floor. This is one of the wedding hotels in Cornwall and offers hotel accommodation for you and/or your guests. Set on the cliff tops at Newquay Cornwall and overlooking the famous Fistral Beach The Esplanade makes a beautiful wedding venue in Cornwall and Fistral Beach is a perfect backdrop for those all important wedding photos. The Esplanade is one of the largest wedding venues in Cornwall with the capacity to cater for up to 250 guests and is also a registered civil ceremony venue in Cornwall. The Falmouth Hotel situated above Castle Beach in Falmouth Cornwall is an impressive wedding venue for your Cornwall wedding and provides a stunning Cornish backdrop for that all important day. The Falmouth Hotel is a licensed venue for civil ceremonies in Cornwall and is a venue for your wedding breakfast and evening reception. Fowey Hall is an impressive Queen Anne mansion overlooking the pretty town of Fowey Cornwall, estuary and sea beyond making it an sophisticated venue for your wedding in Cornwall. A licensed venue for civil ceremonies in Cornwall and able to cater for all your wedding day needs. Fowey Hall can cater for small weddings or larger weddings on an exclusive use basis. Situated in 17 acres of private Cornish headland in Newquay Cornwall the Glendorgal Hotel overlooks Porth Beach and the sea beyond providing a stunning backdrop for your wedding in Cornwall. If you love the beach Glendorgal could be an excellent wedding venue in Cornwall for you as the location allows you to walk straight down onto the sandy beach of Porth. The hotel is an approved civil ceremony venue and can host your wedding breakfast and evening celebrations. They have different wedding packages on offer. Set on the cliffs in the centre of Newquay Cornwall with views of the beach and sea beyond The Great Western Hotel could be the wedding venue in Cornwall you are looking for. The Great Western is a licensed venue for your civil ceremony in Cornwall and is a venue for receptions of all sizes. The Greenbank Hotel Falmouth Cornwall is a gorgeous wedding venue in Cornwall . The hotel is set on the harbourside with direct access to a private beach and stunning views out to sea, making it ideal for wedding receptions Cornwall. If you are getting married in Cornwall and looking for wedding hotels Cornwall which can offer everything for your big day then the Greenbank is a licensed venue for civil ceremonies in Cornwall and can hold your wedding breakfast and evening reception as well as having plenty of accommodation for your guests. Set on the seafront at West Looe Cornwall with panoramic coastal views the Hannafore Point Hotel makes an elegant wedding venue in Cornwall. The picturesque Cornish coastal surroundings and sea views from the public rooms make this one of the wedding reception venues Cornwall with a perfect backdrop for your wedding and wedding photos. The Hannafore Point Hotel is a licensed venue for civil ceremony weddings in Cornwall and also has facilities to hold your wedding breakfast and reception for up to 160 guests. Set near the cliff edge at the famous Fistral Beach Newquay Cornwall the Headland Hotel has fantastic sea views and is an impressive and romantic wedding venue in Cornwall and an ideal place for any Cornish wedding. This wedding hotel caters for small intimate weddings in Cornwall and grand affairs with all the frills. Licensed for civil ceremonies the venue also caters for wedding breakfasts and is one of many good wedding reception venues Cornwall. Set on the cliffs above the beautiful harbour of Port Isaac Cornwall this is one of the Cornwall wedding venues set in private grounds. With nearly 4 acres of grounds and gardens and views overlooking the stunning North Cornwall Coast is the Longcross Hotel which could make an excellent venue for your wedding in Cornwall. The Longcross is a boutique hotel making it an option as one of the small wedding venues Cornwall and is licensed to hold your civil ceremony and / or is able to host your wedding breakfast and reception. The hotel is one of the Wedding reception venues Cornwall also able to be used on an exclusive use basis. If you are getting married in Cornwall then Mount Edgcumbe House could be a grand setting for your wedding in Cornwall. The former home of the Earls of Mount Edgcumbe, set in Grade I Cornish Gardens within 865 acres of Country Park this would make an impressive wedding venue for your wedding in Cornwall. Mount Edgcombe House is a licensed venue to hold a civil ceremony in Cornwall and has a choice of locations to be married. The Great Hall where the bride can make her entrance down the imposing staircase, The Drawing Room with views over the garden and Plymouth Sound, The Library for a more intimate wedding or those looking for small wedding venues Cornwall, or outside in the Summer House. For your wedding breakfast or wedding reception in Cornwall the House offers a choice of the Orangery Restaurant or a marquee on the Lawns. Wedding Venue Cornwall With Accommodation? Surprise your guests with a Cornwall wedding venue with a difference � a Maritime museum. Set on the harbour front in Falmouth Cornwall with views over Falmouth and direct access from the harbour the Maritime Museum offers various options and settings for your Cornwall wedding and is a wedding venue in Cornwall with a difference. This venue is licensed to hold civil ceremonies and small or large Cornwall wedding receptions. They are able to work with you to create the special day you want. For those getting married in Cornwall The Old Custom House and Pescadou Restaurant Padstow Cornwall is a licensed venue for a civil ceremony wedding Cornwall and hosts wedding breakfasts and receptions in their restaurant. If you are looking for wedding reception venues Cornwall with beautiful views then the views over the Camel Estuary and picturesque harbour of Padstow make an excellent backdrop for a wedding and may make this the wedding venue in Cornwall for you. Wedding Reception Venue In Cornwall? Set on the picturesque water front of the idyllic Fowey Cornwall the Old Quay House is a boutique hotel able to host wedding receptions Cornwall. With an award winning restaurant and license for ceremonies this is a wedding venue Cornwall which can host your whole wedding day and could be an excellent setting for a wedding in Cornwall. The Old Quay House is a licensed venue for a civil ceremony in Cornwall and or is able to host the wedding breakfast and reception for weddings in Cornwall. If you are looking for places to get married in Cornwall then St Ives Cornwallis a beautiful choice with glorious beaches and pretty buildings the town would make a stunning backdrop for weddings in Cornwall. The Pedn-Plva Hotel is set above Porthminster Beach in St Ives and has views over Porthminster from the long conservatory beside the restaurant, making it an interesting possibility as a venue for your wedding in Cornwall. The Pedn-Olva Hotel is one of the Cornwall wedding venues licensed for civil ceremonies in Cornwall and can also host your wedding breakfast and reception. Get married in a castle at this wedding venue Cornwall you actually can. Set in a magnificent coastal setting on the headland at Falmouth Cornwall Pendennis Castle is a stunning backdrop and wedding venue for a wedding in Cornwall. The Castle is a licensed venue to hold a civil ceremony in Cornwall and can hold drinks receptions and dinners. The wedding venues Cornwall available are the Lower Gun Room within the Castle Keep, the Royal Artillery Barracks or a marquee on the lawned area. The views from the castle are stunning and when floodlit at night it really is a fairy tale wedding venue. Penmorvah Manor Hotel is a wedding venue in Cornwall which is a country house set in 6 acres of private grounds, with sea views from some areas. Penmorvah is licensed for civil ceremonies in Cornwall and or can hold your wedding reception and could be one of the wedding reception venues Cornwall worth considering for your Cornwall wedding. 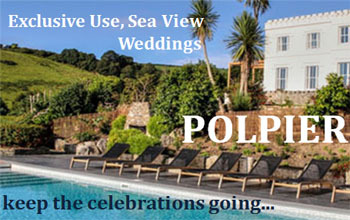 The Polurrian Hotel would make a stunning wedding venue in Cornwall. Set on the cliffs outside Mullion which is on The Lizard Peninsula Cornwall the Polurrian has fantastic coastal views and inside offers luxurious surroundings making it one of the grand wedding hotels Cornwall. With access to the nearby Cornish beaches and setting in 12 cliff top acres this is one of the wedding venues in Cornwall which would make a a fabulous backdrop for your wedding and photographs. The Polurrian is a licensed venue to hold civil ceremony in Cornwall and or is an ideal place to hold your wedding breakfast and wedding receptions Cornwall. The hotel is able to cater for small intimate weddings or those up to 80 guests. For brides and grooms planning weddings in Cornwall the mid-19th century Porth Veor Manor sits in an elevated position in private gardens and overlooking Porth Bay and Trevose Head Lighthouse. This is one of the wedding venues Newquay available for hire on an exclusive use basis and which could make an excellent wedding venue in Cornwall for your special day. Porth Veor is a licensed wedding venue for civil ceremonies in Cornwall and can host the ceremony or reception or both for your wedding Cornwall. Receptions can be held inside or for larger weddings in a marquee in the gardens. The hotel has access to the beach and can offer hotel and self catering accommodation for your guests. 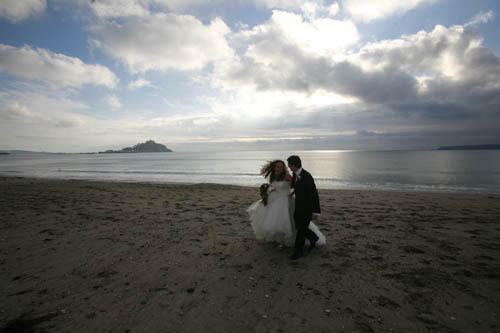 The Queens Hotel is one of the few Cornwall wedding venues with fantastic views over Mounts Bay. The hotel stands majestically on the seafront in Penzance Cornwall. The staff are friendly and helpful and The Queens Hotel is a Cornwall wedding venue catering for both large and small weddings in Cornwall. The hotel has two room which you can use for your wedding. The smaller room is one of the nice small wedding venues Cornwall with sea views and is a picturesque setting for an intimate wedding Cornwall or smaller wedding breakfast. The large ballroom has large windows with sea views and a large dance floor, and is one of the larger wedding reception venues Cornwall has to offer, an ideal setting for a large Cornish wedding. Experienced at holding weddings the Queens has wedding packages and menu options to choose from and will work with you to personalise your day. The bedrooms at the Queens are large and the sea view rooms have fantastic views over Mounts Bay. For those wanting beach weddings in Cornwall this is the big house by the sea! Ideal for an informal intimate wedding in Cornwall, with the realistic idea of being able to have exclusive use of the whole house, gardens and 15 guest apartments and studios. Or, simply hold your Cornwall wedding breakfast here. This is a Cornish wedding venue which can hold receptions for weddings in Cornwall of up to 50 guests with larger Cornwall weddings using a marquee in the gardens. The venue is licensed for civil ceremonies and is only 2 minute walk away from the beautiful beach which is ideal for photo opportunities and relaxing with guests. Rosteague is a beautiful, private manor house with lawns to the front and one of the wedding venues Cornwall with views to the sea. They venue is a licensed venue to hold your civil ceremony in Cornwall. At Rosteague you can hold your wedding reception inside the Elizabethan house or outside in a marquee, you can even take your vows in a thatched rose covered summer-house a romantic wedding venue in Cornwall. For your weddings in Cornwall get married in a Cornish Castle. St Mawes Castle is an impressive wedding venue in Cornwall with stunning views over the sea. If you are looking for places to get married in Cornwall which will have an impact on your guests then this would make a dramatic setting for your wedding. A licensed venue for civil ceremonies in Cornwall with rooms inside the Castle or the outdoor ruins of the Lower Fort available to take your wedding vows. Receptions and wedding breakfasts for your wedding Cornwall can be held in the Castle or outside in a marquee in the impressive grounds. With this stunning location you will really know you are getting married in Cornwall. Set on the seafront at Falmouth Cornwall this is one of the wedding reception venues Cornwall where you can enjoy views over the sea and easy access to the beach making it ideals for beach weddings Cornwall. St Michaels Hotel is a wedding venue in Cornwall which is licensed to hold your civil ceremony in Cornwall and able to host your wedding breakfast and evening celebrations. Being one of the wedding hotels Cornwall they also have lots of accommodation available for your guests. The Bay Hotel, Newquay Cornwall is a wedding venue in Cornwall where you can hold your civil ceremony and or wedding celebrations. The Bay Hotel is set on the cliff tops above the famous Fistral Beach Newquay and enjoys stunning views over the beach and sea - ideal for those wanting beach weddings Cornwall. The hotel has 92 bedrooms and could be good for those wanting large wedding reception venues Cornwall as they are able to cater for a wedding of up to 160 people. The cliffs and beach are a fabulous backdrop for your Cornwall wedding. The hotel also has a spa to relax in before your big day. At the Castle Bude you can hold your wedding in Cornwall in the Willoughby Gallery or the intimate Blanchminster Room. With the backdrop of the beautiful Bude Cornwall beaches and sea The Castle Bude is a picturesque wedding venue in Cornwall and a romantic and different choice for your civil ceremony. The surroundings offer an excellent backdrop for your photos. A different choice for weddings in Cornwall. The views from the Edge in Port Isaac Cornwall would make an ideal backdrop for a wedding reception in Cornwall and their commitment to using locally sourced food and free-range, ethical meat and support sustainable farming is a fantastic ethos to support, and means you enjoy good Cornish produce and support the local Cornish producers which is ideal if you are getting married in Cornwall. The Edge is one of the wedding venues Cornwall which offers stunning views from the picture windows and promises to go all out to make your day special. The restaurant can seat up to 60 guests and more for buffet style meals. So whether you want to book a table for 18 people or to book the whole restaurant for a private function they will work with you to provide exactly what you want and can tailor menus and service to suit your needs. You can hire the whole restaurant for your exclusive use. Or you can hire the upstairs restaurant for your use. They also have a small private room that can seat up to 16 guests which may be ideal for those looking for small wedding venues Cornwall in which to hold an intimate wedding celebration. For brides and grooms getting married in Cornwall The Royal Duchy Hotel in Falmouth Cornwall would make a very grand wedding venue in Cornwall. Set on the sea front of Falmouth Bay with access to the beach and gardens which would make a perfect backdrop for wedding photos. The Royal Duchy is a 4-star hotel which is one of the wedding venues in Cornwall licensed to hold your civil ceremony in Cornwall and or can host your wedding breakfast and evening reception. The Slipway Hotel is a wedding venue in Cornwall in Port Isaac. Port Isaac is a pretty fishing village which would make a great backdrop for a wedding in Cornwall. The Slipway can hold Wedding ceremonies in a choice of locations in the hotel and following drinks and canap�s can be enjoyed in the restaurant or outside on the front terrace overlooking the harbour. For the wedding breakfast a wide selection of menus are on offer including a sit down meal or buffet. This wedding venue in North Cornwall is ideal for intimate weddings of 45 or less. Evening celebrations can be arranged to suit the requirements for your weddings in Cornwall. CORNWALL HAS LOTS OF ROMANTIC HIDEAWAYS AND LUXURY HOTELS SO WHATEVER YOU FANCY FOR YOUR HONEYMOON IN CORNWALL THERE WILL BE SOMEWHERE FOR YOU. VIEW OUR TOP TEN HONEYMOON LOCATIONS IN CORNWALL.